The Swarovski Core Assortment was designed to take the hassle out of choosing and ordering crystals. 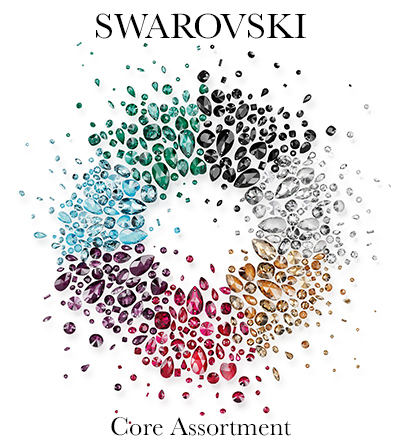 The Core Assortment includes 30 classic Swarovski styles across all product ranges in 7 main colors (Crystal, Jet, Aqua, Amethyst, Emerald, Light Colorado Topaz and Scarlet). All these items will be available and in stock with Swarovski when you need it. With this new offering, designers can now easily design knowing the Swarovski crystal colors they need will be available across all product groups. Flexibility. Ease. Speed. That’s what the Swarovski Core Assortment is all about! Choose a color from the Swarovski Core Assortment below to see the full product offering in each of these colors.